In a brilliant essay, Friedrich Kittler points out that the phonograph is such a simple invention, there's no real reason why it had to wait for Thomas Edison (or Charles Cros, the Frenchman whose written description of the phonograph predates Edison's invention, but whose lack of funds prevented his actually building the thing). What is most surprising in history, almost unimaginable, is that among all the great inventors across the centuries, not one thought of the Phonograph! And yet most of them invented machines a thousand times more complicated. 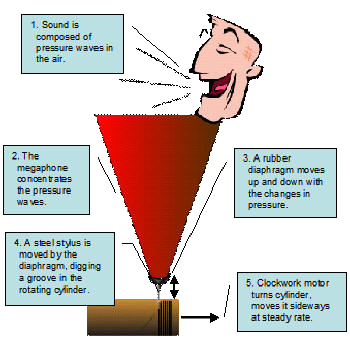 The Phonograph is so simple that its construction owes nothing to materials of scientific composition. Abraham might have built it, and made a recording of his calling from on high. We have just come through perhaps the only century in human history when a technology of sound recording existed that could be understood by the common man. I watch my seven-year-old grandson, Zachary, operate his MP3 player with confidence, yet no comprehension whatsoever of its principles. When I was his age, I'd already taken a phonograph apart and put it back together, and understood, at least at a rudimentary level, how it worked. —Not because I was so brilliant, but because the technology was so simple. At least as far back as the Sumerians, humans have known how to create artificial sounds. 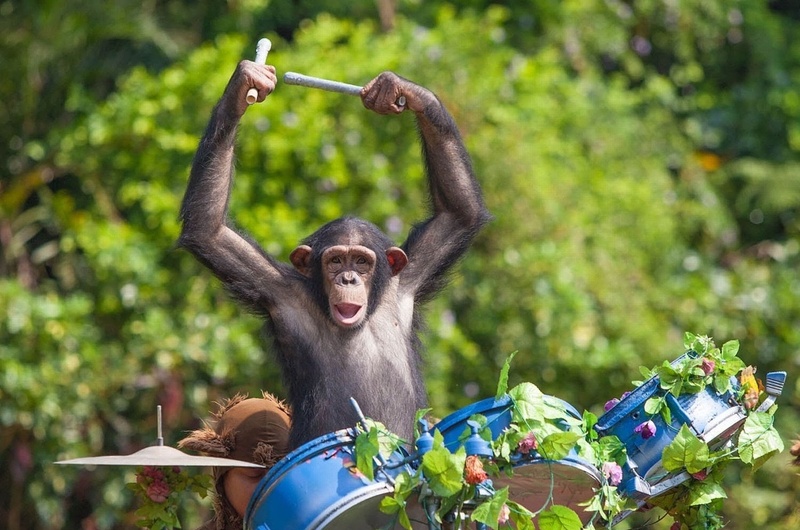 Even chimpanzees know how to bang rocks and sticks and do so in the wild, sometimes sounding indistinguishable from the jungle drums so dreaded by the likes of Bob Hope or Dorothy Lamour during their 1940s faux-African adventures. But it took humans to discover that a string, stretched taut, could be made to vibrate by plucking it or stroking it with another string, and that those vibrations made a sound. Almost immediately this knowledge gained practical use with the development of simple guitar-like instruments. I have no idea what possessed the first guy who did so, to blow into a hollow ram's horn, but the discovery that this also produced a loud and distinctive sound led to all the brass instruments of today. When a person accidentally played a particularly pleasing tune, it must have seemed desirable to preserve that melody somehow. Yet, instead of trying to record the performance, the Sumerians (the Biblical Abraham was a Sumerian) developed a system of music notation that would record the piece, as writing records ideas and not actual spoken words. A tuning fork is a tool used to tune the instruments in an orchestra. 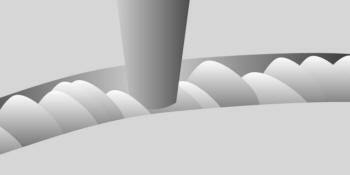 The tool is struck on a hard surface, and the force causes its tines to vibrate at a known frequency, producing a characteristic note. The members of the orchestra listen to that note, and tune their instruments to match. It wasn't until the world was exposed to modern scientific inquiry that physicist Wilhelm Weber in Göttingen thought to let a tuning fork record its own vibrations. He attached a pig's bristle to one of the tongues which etched its frequency curves into sooty glass. Thoughtful people had probably realized for millennia that sound, or at least the sound of the strings of a lyre, was produced by vibrations. But now, at last, the wavy lines of those vibrations could be seen, and measured. 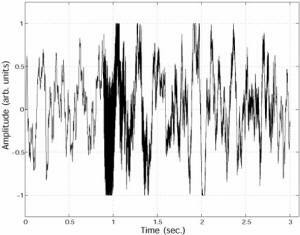 It was found that the frequency of sound was high, usually more than 100 beats per second and sometimes a thousand or ten thousand times that; and that pitch was directly related to the frequency. The higher the pitch, the greater the frequency. Weber made his discovery in 1830, and yet it was decades before Cros wondered how those frequencies could be recorded in such a way that they could be reproduced. In 1857, Edouard-Leon Scott patented a device for recording sound, which he called the phonautograph. It made use of a cylinder turned by a hand-crank, although a clockwork motor could also do the job with a steadier speed and therefore more predictable results. These recordings, like Weber's, could not be played back. The device was used for the study of sound, only. Two more pieces of information contributed to the puzzle. One was the phenomenon of sympathetic vibrations. If you take two identical tuning forks, and strike one so that it makes its characteristic tone, and place it near the other—the silent one will begin to vibrate in sympathy to the struck fork, also producing the tone. 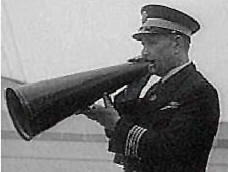 The second was our instinctive use of cupped hands to amplify one's voice over a distance, that had led to the invention of the megaphone, a cone used by persons who needed to project their voices into a large auditorium or over a distance. 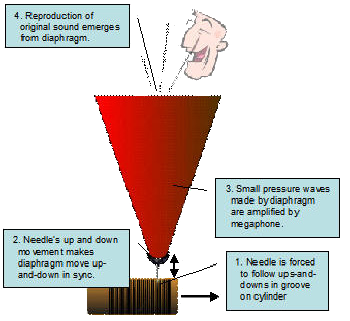 Suppose a needle were stuck into the small end of a megaphone, and that needle passed over some substance that would record the sound waves in such a way that a second pass through the resulting impression would cause the needle to recreate the original sound waves. What would happen? The answer to that question was the phonograph, a device for recording and recreating sounds. Thomas Edison, the famous American inventor, by the late 1800s had created an "invention factory" at which he employed many men to simply tinker. 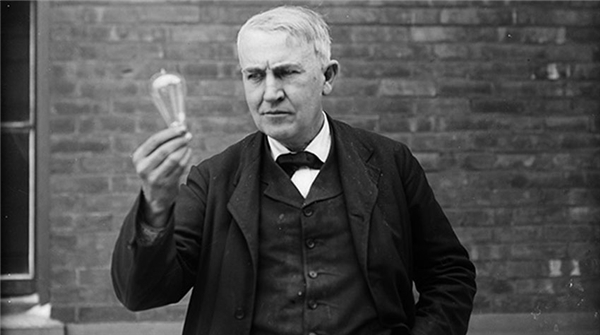 In exchange for the freedom to develop whatever inventions occurred to them, the rights to those inventions were turned over to Edison's company and Edison himself took credit for them. Still, many of the inventions that came out of Edison's factory did begin with drawings or notes that Edison himself wrote down, so that his hired tinkers merely put together the pieces. Such was the case with Edison's "talking machine" in 1877. He began with the basic design of Scott's phonautograph, concentrating on finding a material that would allow playback as well as recording. Edison with his tinfoil phonograph. When recording, the needle creates an up-and-down groove in the wax surface of the cylinder. When playing back, a needle is allowed to follow the groove, and to move up-and-down with it. 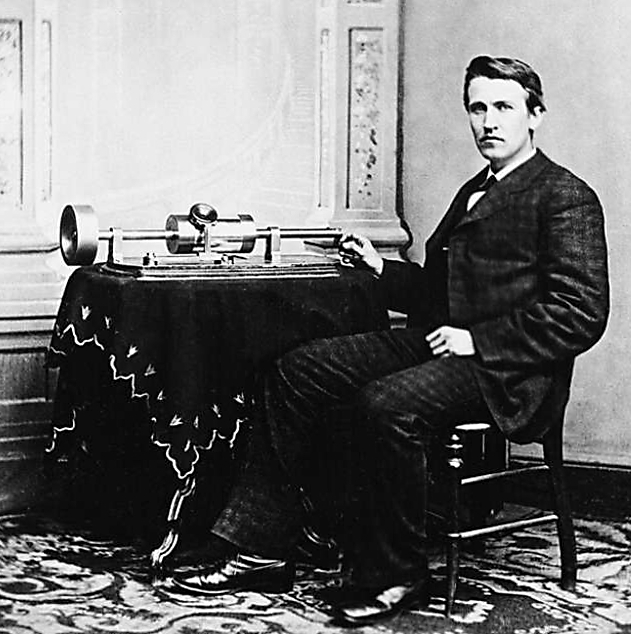 Hear Edison's promotional recording, which was played for customers to demonstrate 1906 "Talking Machines". Edison's notes show he had also considered recording onto a flat platter instead of a cylinder. Some of his engineers advised following such a route, because they could envision easy ways to mass produce such platters. But when a platter is rotated at a constant speed, the material of the platter passes beneath the needle more quickly on the outer part than when it is near the center. This makes the peaks of the recorded sound waves closer together near the center of the platter than at its edge, which causes sound quality to vary somewhat from the beginning to the end of a single recording. Thus, Edison insisted on sticking with cylinders and didn't bother to patent the disk variation. That oversight made the eventual, successful, disc phonograph a commercial possibility…for others! 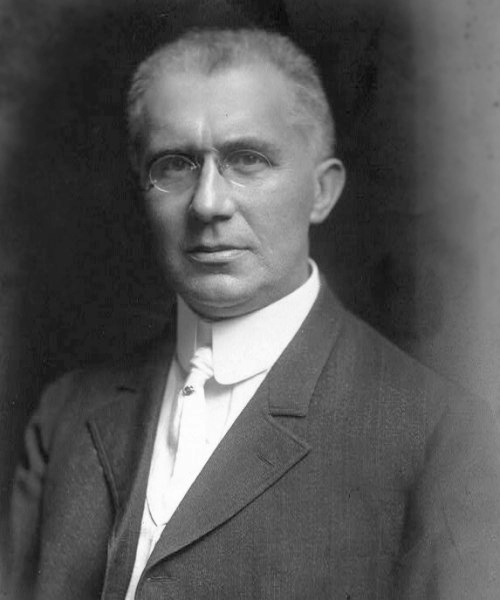 Emile Berliner, an independent inventor, did not have access to Edison's notes but was free to examine Edison's talking machines once they went on sale. He noted that the talking machine had two flaws: One: the cylinders which could only be duplicated by recording a new one from an existing one—which resulted in both very poor sound quality and high price. Two, Edison's needles vibrated in an up-and-down manner, creating "hills and dales" in the cylinder. In practice, the needle often skipped from hill to hill, which further reduced fidelity. In 1887, Berliner patented his Gramophone, which used lateral (side-to-side) movement of the stylus to create a spiral groove on a flat, spinning platter. It was a clear improvement; yet greed prevented its wide-spread adoption—the government protection provided by Berliner's patents prevented anyone else from making a record to play on the Gramophone without his permission and a royalty payment—until the patent ran out in November, 1918. But when it did, instantly dozens of new record companies sprang up, issuing every kind of song, dance, and voice recording you can imagine. Berliner's Gramophones sold wildly, even after his patent ran out, because of consumer familiarity with the name, which proved to be far more valuable than any royalties lost on a few records; after mergers, acquisitions and lawsuits the United States Gramophone Company eventually became entertainment giant RCA. By now Edison's cylinders were made of a precursor to plastic he called "Blue Amberol" which was far superior to wax in durability but still impractical for mass production. Production of Blue Amberol cylinders was halted before 1930. The platter had won. Yet Edison was not one to give up easily. Still holding a patent on up-and-down recording, he introduced a hill-and-dale version of a platter phonograph, which made his disks incompatible with those of the Gramophone. But it was too late; too many people already owned Gramophones to buy incompatible discs; and there were too many Gramophone-compatible discs available to persuade anyone to buy a player that couldn't play them. In a foretaste of the Betamax/VHS battle of the 1970s, Berliner's disks eventually won out, and even Edison eventually capitulated. Since these talking machines were the last devices of their type whose technology was so basic that a seven-year-old could understand them, let's take a moment to examine another type of recording from the same period, that used by player pianos. These devices were actual pianos and could be played like any other piano; but they could also play pieces automatically, pieces that had been recorded by a professional pianist, and the recordings mass produced. The recording was made on a long roll of stiff paper placed into a special recording piano. 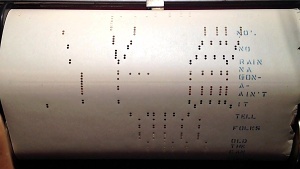 This piano, in addition to causing the piano's strings to be thumped in reaction to the piano keys being pressed, also punched holes in the stiff paper, as the paper moved beneath the punches at a steady rate. The paper was wide enough to accommodate an array of 88 punches that corresponded to the 88 keys of a piano, as well as a couple of other punches that corresponded to the piano's pedals. The holes varied in width depending on how vigorously the key was struck, and in length depending on how long the key was held down. To play back the performance, the roll would be rewound beneath an array of 90 suction devices that aligned with the holes. When a hole came along, air would feed through and cause the corresponding piano key to depress—how hard depended on the size of the hole, which corresponded with how hard the human pianist originally pressed the key. The key remained down until the hole ended, which corresponded to how long the pianist had originally held it. Thus, the original performance of the pianist could be recreated, with its variations in intensity, speed, and so on, all retained. However, this was a piano recording, not a sound recording. It would not record, for example, the coughs of someone in the room or the bark of a distant dog heard through the window while the recording was being made. Have you ever wondered why sounds differ? Why does a violin sound different from a trumpet, for example, or why Bart Simpson's voice is distinct from Bette Midler's? It turns out the differences in the way the air pressure waves hit the ear can be detected by the brain. Thus we can tell the difference between violins and trumpets. In addition to the bare instruments, you also get room echo, sounds of coughing if anyone present coughs, the shuffling of papers—all of it. That's why people must keep quiet when a commercial recording is being made. Yet the result is much, much richer—and satisfying—than that which a simple piano roll can produce, which is why player pianos are not as popular as CD players. The goal, then, was to improve the quality of the sound produced by a sound recording—to get it as close as possible to the original experience. And the tinny, scratchy sound produced by the early talking machines, even by Berliner's side-to-side recordings, left a lot to be desired. Still, even these wouldn't have existed if Edison, backed by the power of the modern law firm, had patented his devices a century later. His lawyers would never have let him neglect to renew a patent, and every record sold would be a cylinder, expensive to make, and saddled with a royalty payment (as were modern CDs up until 2002 when that patent ran ran out; each CD sold had a nickel royalty go to the companies that developed them, Philips and Sony). There were two areas where improvements could be made within the requirements of the Gramophone record: In the recording of the sound, and in the reproduction of the sound. And the first big improvement came with the invention of the electric microphone, which is the subject of the next essay in this series.